Despite lots of newer floor and wall covering systems coming onto the market bathroom tiles are still the most popular choice. Tiles can be used throughout the home but in colder climates their use tends to be limited to the bathroom, kitchen and sometimes hallways. The choice of styles, sizes, materials, patterns, colours and finishes is huge and when you consider that many different bathroom tiles can be used in the same room, as part of the same design, then the options can become a little overwhelming. For a minimalist look many bathrooms have the same tiles fitted to the wall as those used on the floor which will result in the eye being drawn to the bathroom suite and shower cubicle rather than the wall and floor covering. Not all tiles are suitable for this type of installation - floor tiles tend to be thicker and heavier that standard wall tiles so you need to take into consideration the weights involved as well as the suitability of the tiles for use in wet areas such as shower cubicles. Sometimes tiles are just limited to one area of the bathroom rather than covering the whole of the room. 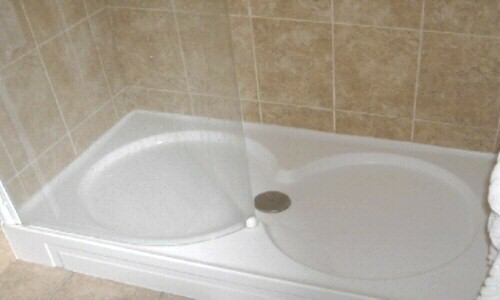 Bath surrounds, splash-backs behind basins and sinks and shower cubicles are the most common areas tiled with the rest of the room being covered with an alternative product. A variation on this theme is the use of two differing tiles. For example mosaic tiles might be used to clad the inside of a shower cubicle but the rest of the room finished in a plain, larger tile; this will have the effect of making the shower the focus of the room. See our gallery for more examples of bathroom tile effects.